Sir Ken Robinson is an amazing presenter. He really captures his audience. He make things relevant; uses his own stories, success stories and stories you can identify with; rhetorical questions; and comedy that relates to his topic. He manages to tie everything together and creates solid conclusions. I would definitely say I would like to perfect my presenting craft to be similar to him. We are getting our children through education by anaesthetising them (shut off their senses); we should be waking them up to what is inside of themselves! Education system is organized by ringing bells, Separate facilities, separate subjects, educating children by age. Kids have different levels of competency at different subjects, perhaps study better at nights than day, or learn better in smaller groups or individually. We are doing standardization, while we should go the opposite direction. We need to move away from trying to make students learn a certain way and change ourselves as educators. Children do not change – you cannot change your students. Teacher need to change the way they are teaching to be able to meet students needs. I wrote a great blog and it got erased, this was my attempt at remembering what I wrote. Being a student in education, I have come to hear this word often. I have come to know it to mean the way you think/want to teach. It is the art or craft of teaching. I believe it to be a cross between beliefs, values and style. Everyone is different so pedagogy differs from every individual. My pedagogy is constantly changing because I am growing as a student teacher. My pedagogy may not stop changing until I retire because I will have different groups of students with different needs so I may need to tweak my pedagogy to meet there needs. 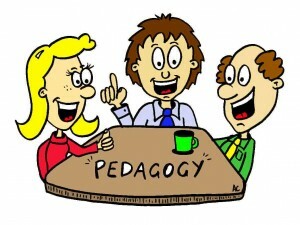 P..P..P……Pedagogy! At first it triggers the thought of children or feet. Feet because foot in French is Pied and then I think of pediatrics which is the branch of medicine that deals with the medical care of children (the ward my mom used to work in).